My new-to-me motorcycle is a real departure from the sport bikes and hooligan machines that usually catch my eye. It has a big fairing, built-in stereo, three bags and an electric windshield you can raise or lower as you ride down the road. 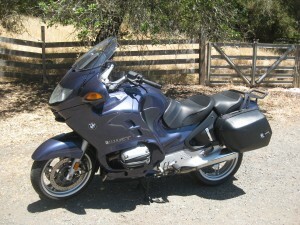 My ’02 BMW R1150RT is nothing if not gentlemanly. It drew light ribbing from my non-riding wife when I pulled it into the garage. I very quickly reminded her that this is the official bike of the California Highway Patrol. They use it to catch bad guys, see. It and its predecessor, the R1100RT, have been written up in every single motorcycle magazine as sport-touring benchmarks. It’s the bike all others try to match. But the damage was done. She planted a seed. That night I began to wonder if I made the right choice. I had been thinking about BMW’s sportier R1100s and even had a line on a Ducati ST3. 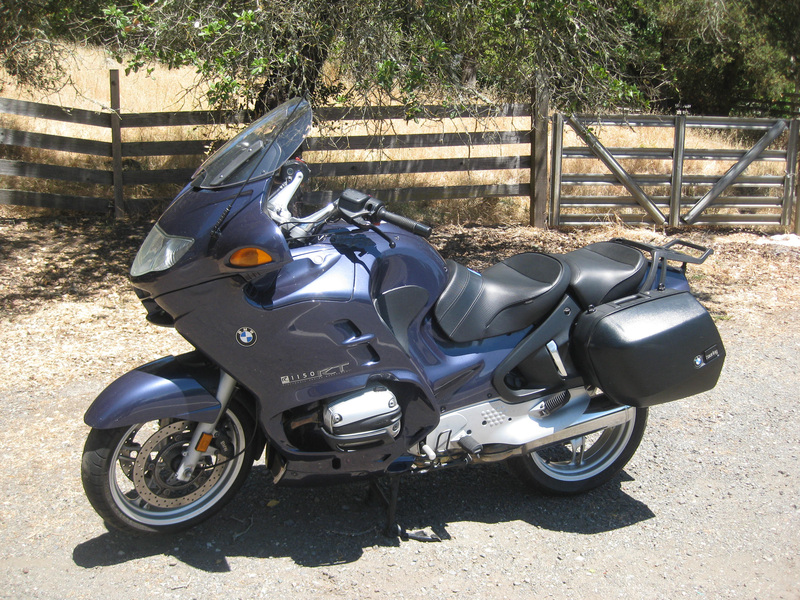 However, neither bike was as confidence-inspiring as the bigger Beemer. Neither had the comfort. I thought about the last painful time I went touring on a sport bike. I cast my lot with the RT. I could live with the pedestrian image. But a slow, ill-handling beast was something I could not tolerate. 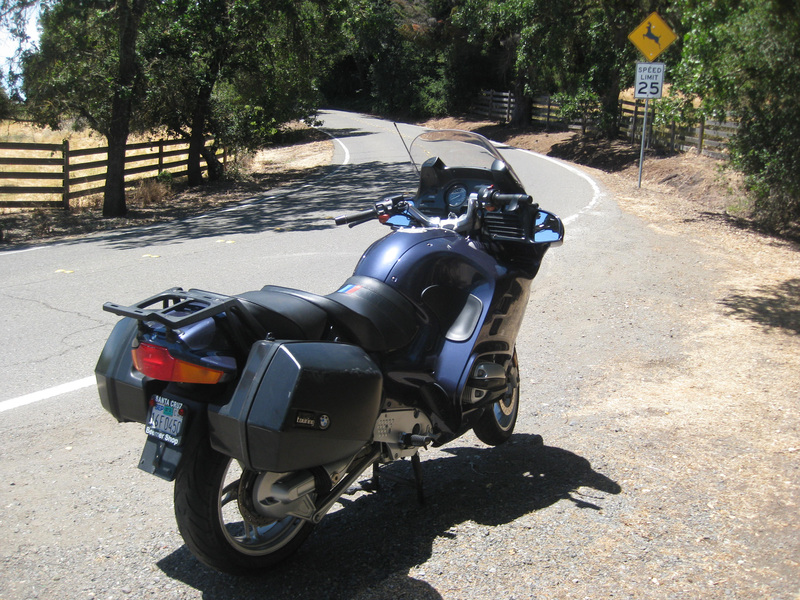 So the next weekend, I put the bike through its paces at the best place around for such a mission — Skaggs Springs=Stewart’s Point Road outside Healdsburg. Getting there from Santa Rosa on Highway 101 was a breeze. The bike eats up slab without a hiccup. It sits high, affording great visibility, and splits lanes well. You get a lot of double-takes from people noticing the familiar CHP profile. Those who don’t pay attention and drift in your lane get to hear one of the loudest air horns ever on a motorcycle. 25 mph? Don't think so. Things didn’t change much on the back roads. The bike is noticeably top heavy but acquits itself well in the twisties. My bike has recently installed Wilbers shocks front and rear so the suspension is tight. The linked ABS brakes take some getting used to. I found the key is to never step on the back brake pedal. It lacks the acceleration of a super bike but it will get into triple digits with minor coaxing. On the way home I played with all the gadgets again, adjusting the electric windshield, fiddling with the heated grips and playing the radio. It may not be cool, but this Beemer truly is the King of the Road.